If you have a problem with a driver, a for-hire vehicle or a base station (company), file a complaint. Use our fillable complaint form, print, sign and mail to the address indicated on the form. Complaints involving criminal conduct, vehicle operation and improper DMV registration should be directed to the Department of Public Safety at (914) 995-8400. All other complaints will be investigated by the WCTLC with assistance from the Department of Public Safety and/or other county departments. Your complaint will be assigned a file number and a receipt of your submission will be mailed to you. Every effort will be made to address your complaint. 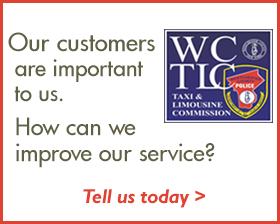 WCTLC will notify the base station in writing as to the nature of the complaint. Within 10 days of receipt of the notification, the base station shall provide WCTLC with a written statement explaining the actions taken to satisfy or handle the grievance. Should the investigation result in an alleged violation of the Westchester County For-Hire Vehicle Law or the WCTLC Rules & Regulations, a summons and notice of hearing will be issued to the offender for appearance before a hearing officer. Findings of fact and recommendations of the Hearing Officer will be submitted to the WCTLC and could affect the base station's WCTLC permit.